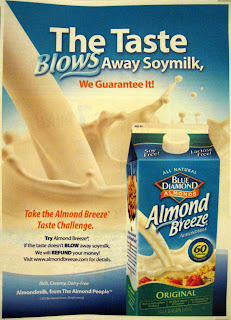 Unflavored almond milk truly does live up to that advertisement. The sweetened, vanilla flavored almond milk, though, is heavenly. You always beat me to it! I just saw that in the mailbox today. I had to do a triple take to be sure that the taste didn't just blow. Baby D is a happy drinker of this brand of almond milk. I'll him if it blows anything!